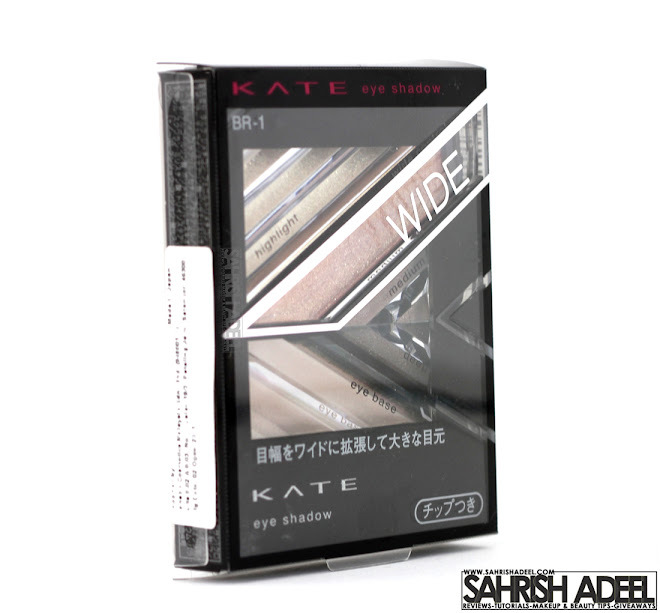 Kate Wide Edge Eyes Eye Shadow Palette in 'BR-1' - Review & Swatches | Sahrish Adeel - Malaysia based Pakistani Beauty & Lifestyle Blogger! If you remember my haul post where I won a goodie bag by Kate Malaysia, you would know how I excited I was to try their products. I finally opened the palette and let's see how I found it. 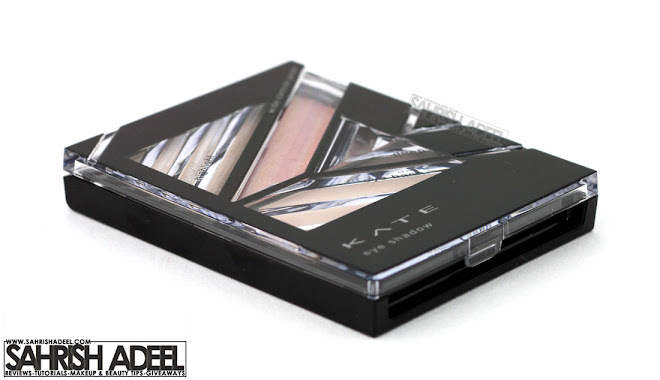 This palette comes in a plastic packaging enclosed in a transparent plastic box. It has five powder eye shadows out of which one is matte and rest of them are shimmery. It also has a dual ended applicator. 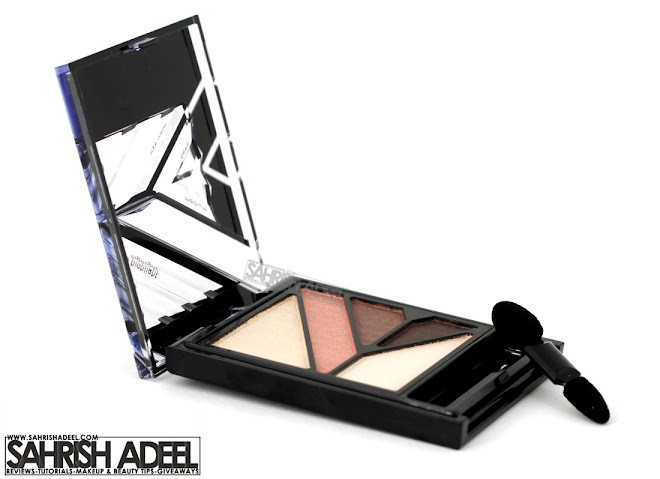 This eye shadow palette comes in five different combinations of shades. It has 2.7g of product. Shade 1 is a shimmery vanilla color. Shade 2 is a shimmery peachy-orange color. Shade 3 is a shimmery light brown color. Shade 4 is a shimmery dark brown color. Shade 5 is an almost matte off white color with a slight baby pink shine. 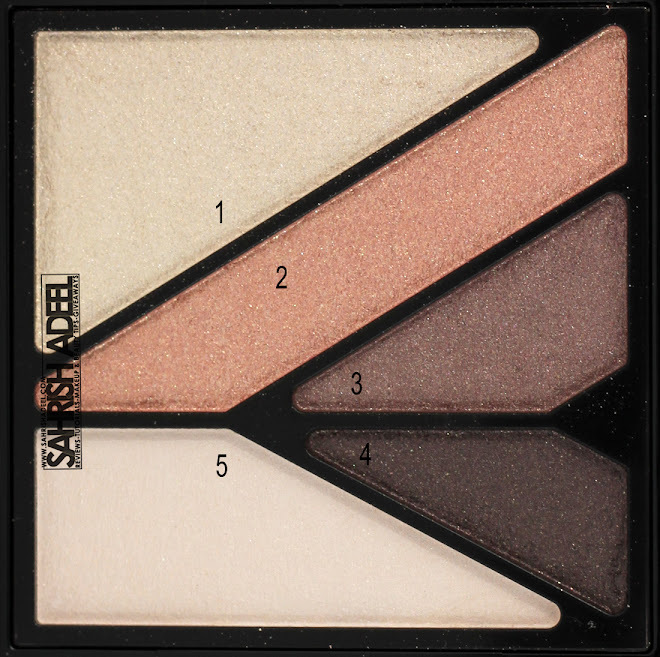 Shade 1 & 2 are the most shimmery shades in this palette while shade 3 & 4 have really light shimmer and shade 5 is not a shimmery shade but has a very light pink shine. Suitable for neutral to smokey eye makeups. Works nice to use on face as highlighter and bronzer. 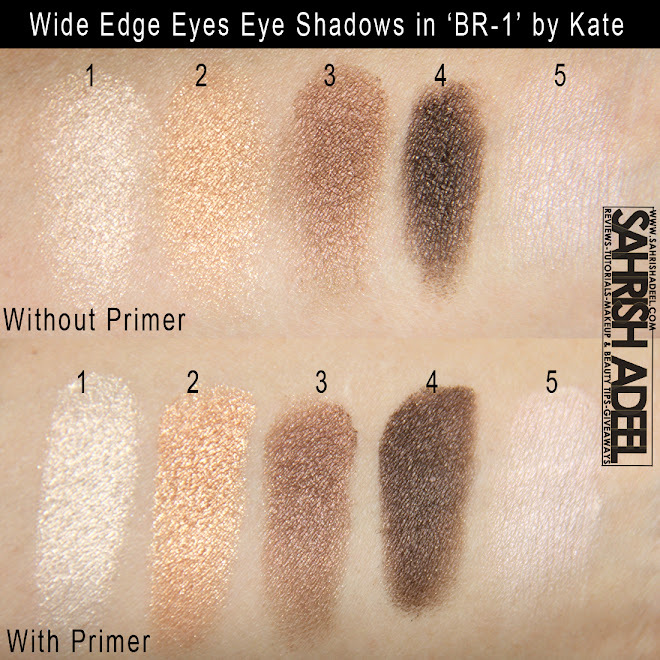 Eye shadows do not crease or tone down for good eight hours if applied over an eye primer. Applicator works fine to pick u the pigment. Eye primer I used for the swatches is MUA's Professional Eye Primer (review here). I like eye shadow palettes than I can carry in my bag during travel and can use it for different looks. It saves space and time that I would otherwise waste to select the single eye shadows to make some combinations. For this point, this palette is really handy. You must be thinking that this is a shimmery palette then how come it is suitable for neutrals looks. Well, the brown eye shadows are not that shimmery and on application they almost look matte. If I talk about pigmentation, all the eye shadow are nicely pigmented. On application (without a primer underneath), the eye shadows look half as they look pigmented in the swatches above specially shade # 2 & 3. With an eye primer, they are just super pigmented and won't budge for good eight hours. I always apply an eye primer as I have oily lids and the eye shadows just never stay for long time and they creases too badly. Also, without an eye primer, the eye shadows do not look rich & enhanced most of the times. I also tries shade 1 & 3 for highlighting & contouring my face respectively and they worked really fine. Shade 5 also works nice when you need a non-shimmery but not too matte highlighting. Overall, I really like this palette and am very happy to try it. If you looking for a travel friendly eye shadow palette that is equally useful to create natural or party eye makeup looks. You should give this one a try. But I would also recommend that you use an eye shadow base or if you have oily lids, eye primer to have long lasting and enhanced results. 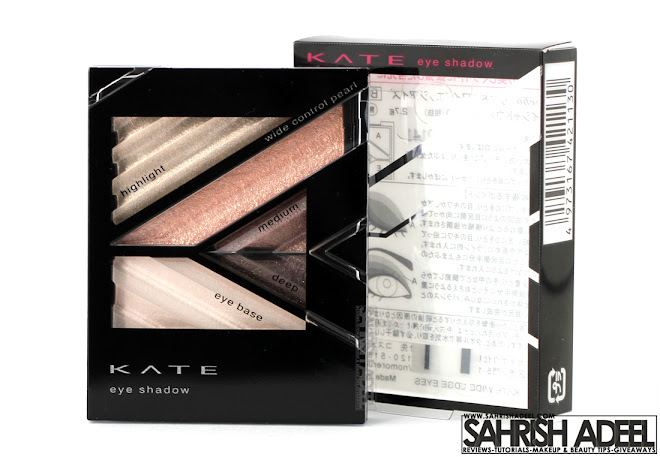 Wide Edge Eyes costs RM 59 and is available at selected Guardian, Watsons & Sasa stores throughout Malaysia. You can also check out more products by Kate here. Have you tried any makeup by Kate? How did you find this brand? 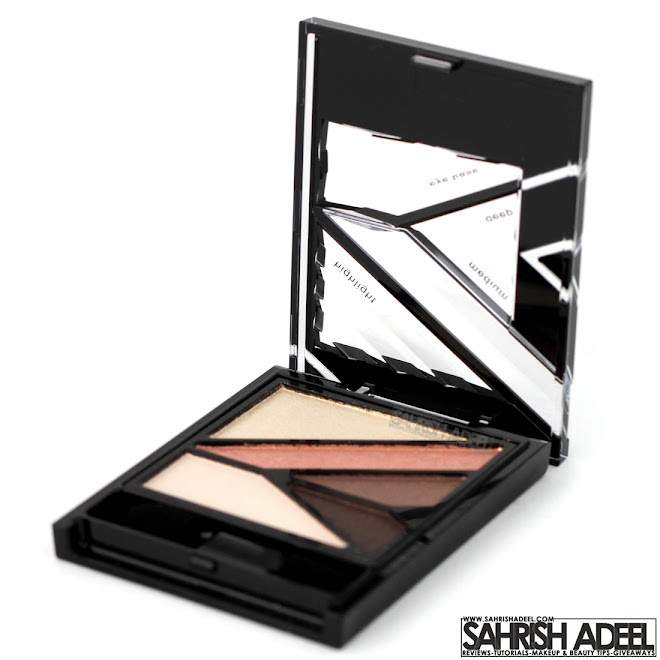 Eye shadow palettes, click here.